When comparing a 4moms baby product, it’s hard for other products on the market to come close. 4moms creates their products using a fresh approach that includes exceptional design and fun features. The 4moms Breeze Playard breaks the mold of other pack and plays with its superior design and easy use. The one push open, one pull close feature allows for the easiest setup and take down you’ll ever experience and makes this purchase totally worth it. Even though it’s a little larger is size, you’ll never want to go back to a regular pack and play again. 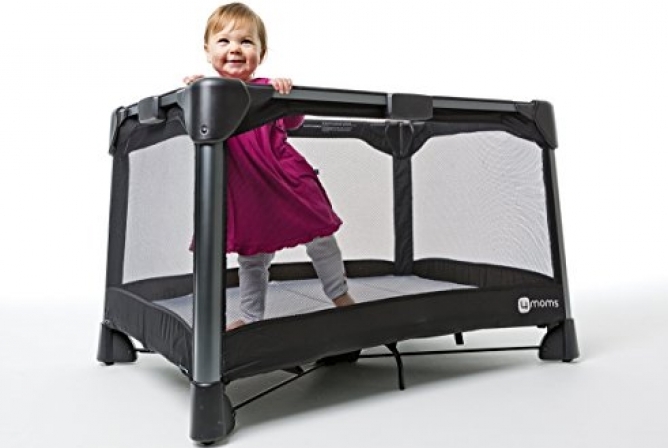 When looking for a safe and easy top-of-the-line pack and play, look no further than the 4moms Breeze Playard. 4moms is known for their exceptionally safe and well-designed products. The 4moms Breeze Playard was well-though out and is designed to provide optimal safety and stability for your little ones. It’s able to be used from birth up until 30 pounds, making it safe for use up until your baby is a few years old. A bassinet is also included and is meant for younger babes, from birth until 18 pounds or until your baby can push up onto their hands and knees unassisted. 4moms goes above and beyond to ensure the safety of their products for your baby. A full mesh sidewall makes ventilation safe and easy for your kiddo. This also makes it simple for caregivers to keep an eye on them from all angles. The mattress is also able to be secured to the base of the crib so that the mattress doesn’t move around and cause a safety hazard. All 4moms products either meet or exceed the standards set by the U.S. Consumer Product Safety Commission (CPSC) and Consumer Product Safety Improvement Act (CPSIA). 4moms meets both the mandatory and voluntary standards set by these bodies. In addition, independent and internationally accredited testing labs are used to test their products regularly. This shows that 4moms goes above and beyond to ensure the safety of their products for your baby. 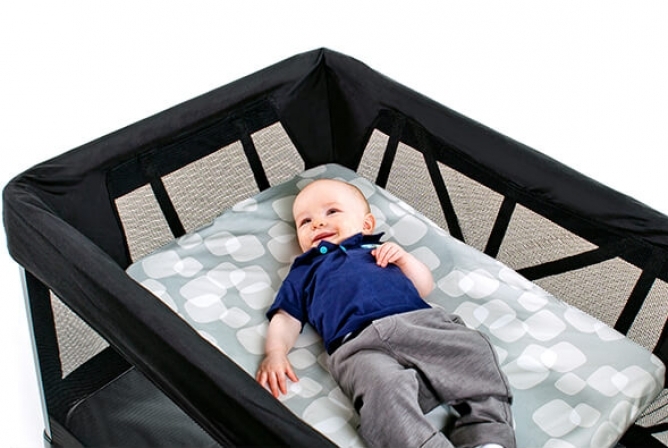 As far as pack and plays go, the 4moms Breeze Playard oozes comfort. Included with this bundle is a soft (but firm) mattress that allows for great sleep support. An included bassinet and bassinet mattress also allow younger babies to feel more secure in a smaller area as well as being closer to mom or dad at an elevated (and secure) height. In addition to providing a nice, large sleeping area…it also provides a nice amount of room for playing and “hang out” time. The four-sided mesh walls also allow for easy ventilation. Also, for babies that have to be in on the action, this feature allows them to feel included from the inside of the playard. A nice feature wth the 4moms Breeze Playard sits a few inches off the ground, unlike some other pack and plays that sit on or very near the ground. This elevated feature is great for temperature control. It provides nice elevation from a cold floor, but also good ventilation for a hotter climate. The larger size of the 4moms Breeze Playard is a great feature for babies that like a little more room. In addition to providing a nice, large sleeping area for growing babes and wild sleepers, it also provides a nice amount of room for playing and “hang out” time. While the larger size can be a hindrance to parents, just remember that it could be a top feature from your kiddo’s point of view. In all sincerity, the 4moms Breeze Playard is one of the easiest pack and plays on the market to use. Its greatest feature is the “one-push open, one-pull close” allowing parents to set up and take down the playard in one easy step. In addition to super easy use, 4moms is known for their exceptional product design and amazing support and customer service. The Breeze also comes with an extremely detailed instruction manual that will tell you everything you need to know. Large size can be either a much-loved feature or a downside to the 4moms Breeze Playard. With an assembled size of 46 inches x 32.5 inches x 29 inches (LxWxH), the Breeze does take up more room compared to other pack and plays. The folded dimensions are 31 inches x 12.5 inches x 12.5 inches (LxWxH). This makes it pretty comparable, although slightly larger, to other folded pack and plays. The large size could be awesome for growing kiddos, and crazy sleepers that might need a little more room. However, the large size makes it a little more difficult to transport. The Breeze does take up more room compared to other pack and plays. With the larger size comes more weight. 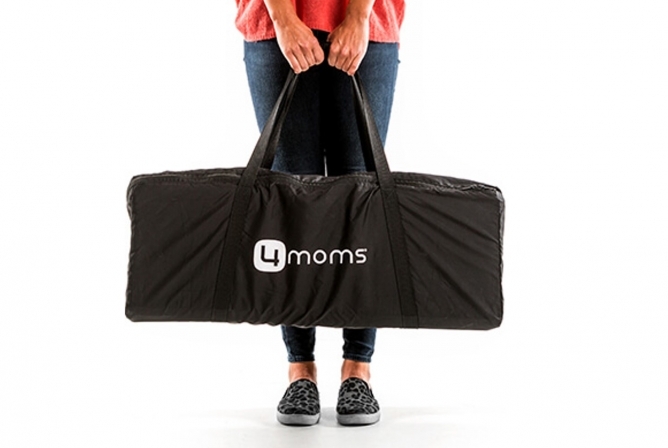 Without the bassinet, the 4moms Breeze Playard weighs in at 30 pounds, and 35 pounds with all the accessories included (like the bassinet, bag, etc). This is fairly heavy compared to most pack and plays on the market, and might make it more difficult for frequent travelers. However, with most playards, there’s a give-and-take relationship, and this is one of the only negative aspects of the Breeze. The 4moms Breeze Playard’s top feature is the one push open, one pull close. Just push down on the central hub of the crib to open. All latches are automatic and don’t include tricky steps. Take down is just as easy. A small nylon strap in the bottom hub of the playard is pulled straight up, causing the crib do disassemble in one smooth motion. No locking handles, no unclicking numerous parts into place. Just one easy step for assembly and disassembly make the 4moms Breeze Playard unmatched in the easy-use category compared to any other pack and play. One thing to know about the 4moms Breeze Playard is that it was made to be set up on a smooth surface. So, rough surfaces (like carpet) can make setup a little more difficult by causing the legs of the crib to catch. Even if this is the case, assembly is still much easier than any other pack and play. The bassinet is also very user-friendly. It’s attached using small hooks that attach to the top frame of the crib. The mattress is soft and the interior of the 4moms Breeze Playard offers a lot of space. This feature is really nice for bigger toddlers or the wild sleepers who might need a little extra room for comfort. Another aspect that might be more difficult for some parents is the assembly of the mattress. Velcro straps are used to secure the mattress into place. Those with a shorter build could have some difficulty reaching the bottom of the crib to secure the mattress in place. On the plus side, care for the 4moms Breeze Playard is very easy. Just spot-clean with mild soap and water, no bleach. You can expect some long use from the 4moms Breeze Playard. With the ability to be used from birth to 30 pounds, this pack and play will last you into toddlerhood. It’s also made of durable materials and quality construction which will allow it to stand up to the abuse that any kiddos (and ahem, parents) put on it. Both parties are guilty. In any case, don’t expect this pack and play to fall apart any time soon. 4moms products are made to stand the test of time and to exceed parental expectations. If you choose to invest in the 4moms Breeze Playard, know that you’re paying for exceptional design, safety, and quality. The Breeze is made of durable and safe materials and has no match when it comes to easy use. Countless parents have stated that the super easy setup is worth the price alone. It also comes with a one year warranty and exceptional customer support which can sometimes be priceless when buying high-end baby products. In addition to the quality, the 4moms Breeze Playard comes with great accessories. 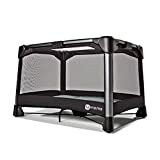 The bassinet, bassinet mattress, crib mattress, and travel case are all included and up the value of this purchase. For an additional buy, check out the waterproof bassinet sheet and waterproof playard sheet that is made especially for the 4moms Breeze Playard. All materials are made for durability and the constant use and abuse kids and parents put on their baby gear. When comparing a 4moms baby product, it’s hard for other products on the market to come close. 4moms creates their products using a fresh approach that includes outstanding design and fun features. 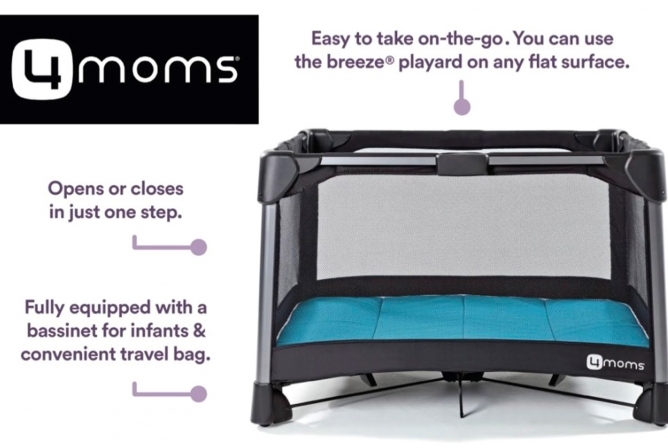 The 4moms Breeze Playard is no different and it puts a new spin on pack and plays. Normally, pack and plays are difficult to put together and take down, and the Breeze breaks the mold. While the large size and heavier weight can be a downside, especially for parents that travel frequently, the positives far outweigh these negatives. Even though it’s on the bigger side, numerous parents have stated that this wasn’t an issue due to the extremely easy use that the Breeze provides. They’ve also stated that the high price tag is worth the buy, because (you guessed it) there’s nothing like fast setup and take down. A great option for parents that don’t want to lug it around is to use it as an additional or temporary sleeping option, like at grandparent’s house or in your bedroom. Seriously, it’s going to be hard to find a better quality pack and play than the 4moms Breeze Playard. For those that have the budget to grab this pack and play, you won’t be disappointed with this buy.